There is nothing quite like an independent bookshop. I know I’m not alone in bemoaning the homogenisation of bookshops these days. I often feel deflated when I walk into Waterstones and see the “3 for 2” table before me. When I see that, I know I’m being spoon-fed my choice of reading whereas I’d prefer to see a visit to a bookshop as an adventure: a delicious experience that I can enter into, with no idea of my destination. On my recent visit to Paris, I had such an adventure. I was excited to return to Shakespeare and Co. bookshop and to introduce my children to the delights of this wonderful place. I first visited Shakespeare and Co. in 2010 when I attended Festival and Co. where my husband David was lucky enough to be employed as a graphic facilitator – to officially illustrate the literary festival. The memories of that festival still linger, but this visit was special in an entirely different way. My daughter, aged 9, is already a Shakespeare fan (she took part in a local Youth Theatre production of The Comedy of Errors) and was particularly keen to visit the shop that she had heard so much about. She was not disappointed. Whilst she tucked herself in a corner of the children’s department, curled up on a cosy seat surrounded by notes left by other children and whilst my son explored the politics shelves, David and I were free to explore the shop and soak up the atmosphere. 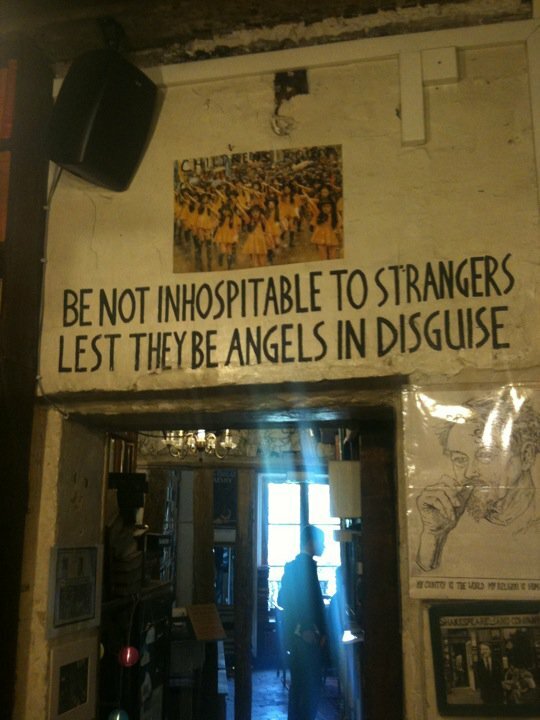 The inscription above the doorway in Shakespeare and Co. 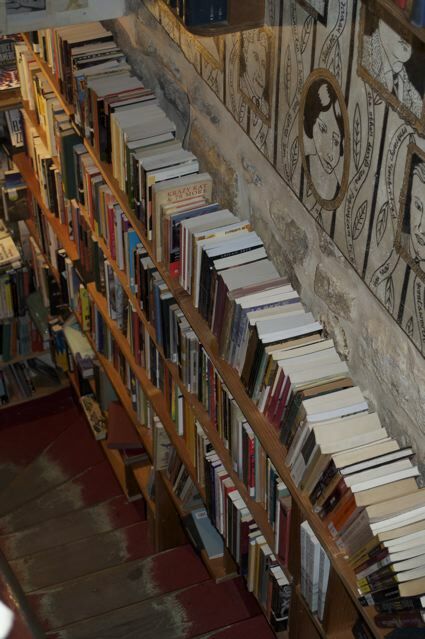 In Shakespeare and Co. second-hand books and new books nestle alongside one another on the many shelves – almost, as David put it, like “a conversation” between authors over generations. The shop is full of what might be termed “forgotten” books. 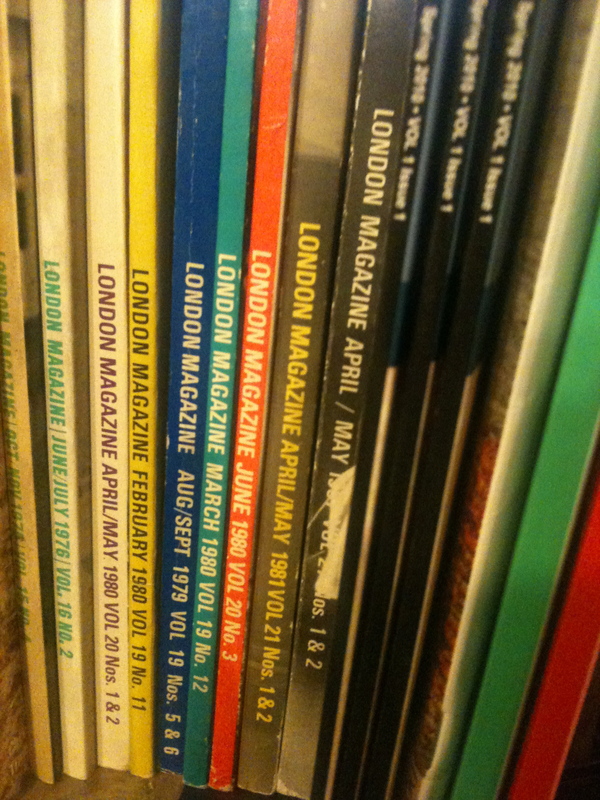 I was particularly struck by one shelf which had rows and rows of back copies of The London Magazine: not just last year’s issues but copies that went back to the seventies. Why did that make a particular impression on me? I began to read the London Magazine in the late eighties when I was starting to write short stories. In 1989 I wrote a short story I was particularly proud of called The Second Line and I sent it to the London Magazine, in a spirit of vague hopefulness. They did not accept the story for publication (I had not really expected them to), but the editor Alan Ross did send me a hugely encouraging letter which made me believe that I might, at least one day, be taken seriously by the literary establishment. It was a turning point. Seeing those magazines brought that memory vividly back to me. But it also reminded me that nothing that is ever published is entirely forgotten. So long as we have independent bookshops that stock old books and magazines, then ideas and literary works that one might otherwise assume are “lost” are in fact not lost at all. They are there, nestling amongst new creations, waiting to be rediscovered. In such an environment, we have a full picture of the literary world. We are entering an entirely different space. In this space, the cult of the new is not king. A work is not only valued because of it’s “marketability” nor are we only looking at authors who have been bought by publishers because they seem like a potential fresh hot property. Authors who only wrote short works and only published occasionally are not devalued. Authors who went out of print mid-career because they failed to sell enough books have not vanished from the shelves. Rather, all writers who have ever been valued by an editor or publishing house have the potential of being present. And so, a reader entering into such a shop is walking into a kind of bookish paradise, with the kind of choice that is simply not possible in a large commercial book-chain. I lingered for around an hour. I could have stayed for weeks. The little bed was extremely inviting. Whilst I was there, I enjoyed the sound of music from the shop piano, as several customers paused to play. (Last time I was there, a cellist was practising in the shop.) I had a conversation with a German man about the unique atmosphere of the shop (how often do I converse with strangers in Waterstones?) and he paused to photograph my daughter there. I took in a photography exhibition and browsed the many literary workshops on the noticeboard. I chose two books to take home with me, as did my daughter. The boys were more disciplined and claimed they had “books enough” already. At the checkout, the cashier stamped my books with the Shakespeare and Co. logo. I chose the Winter 2010 edition of The Paris Review which contains interviews with Jonathan Franzen and Louise Erdrich and Book Business: Publishing, Past, Present and Future by Jason Epstein. (The collected The Paris Review Interviews are a brilliant resource for any writer.) I left the shop even more in love with literature than I was when I entered (if that is possible) and though I confess that I might never entirely quit the Amazon habit, I remain determined to do my in-person book shopping in small stores, especially those that stock a mixture of old and new titles. I would be delighted to hear your experience of special independent bookshops and if you have any particular recommendations, please do share in the comments section below – wherever you are in the world – so that this post might serve as a small directory of stores worth visiting. Oh Jacqui what a wonderfully evocative piece! I am now adding “spend time at Shakespeare and Company” to my list of 40 things to do in my 40s. My favourite bookshop is a secondhand bookshop in Penn, Buckinghamshire. I haven’t been for many years (hope it is still there) but have discovered many treasures on the higgledy piggledy shelves in the past. All independent bookshops have something magical about them I think. When I had a boyfriend who loved old books as much as I do we went on holiday every year to Hay on Wye and spent hours and hours in the bookshops. Heaven. I wait with interest for the collective list to come. Thank-you Caroline. I do hope they keep on coming in, then I can draw up a big map of ‘must-visit bookshops worldwide!’ Your Yorkshire one sounds lovely and vintage poetry… mmmmm. I love how you made this such a sweet piece about the power of literature. It’s great to hear about your family’s meanderings through the shelves. Thanks for sharing your experience with us in this way! Delighted that you had a good experience. Mine was rather different : a month after my novel came out, I was in Paris and asked Shakespeare and Co whether they would stock a few copies. Victorine Meurent, one of my two protagonists, lived in a street a few minutes’ walk from them (in the 1860s) and some of the action takes place there – I thought it might be of interest to them and their customers. They told me that they wouldn’t take a hardback and even if it came out in paperback I would have to bring over copies from the UK – they were not prepared to use Central Books or any other distributor. I didn’t think that was supportive of a new writer. Cynthia, thank YOU for your kind comment and I was thinking today how I should have mentioned you in the piece for in effect introducing me to the shop in the first place. I have such happy memories of visiting the store for the first time with you and being at the festival with you and David. I think those memories will be another post… I still have all my notes! Gosh, Vesna, that is upsetting to read and so surprising and quite absurd. How do they get their books if not via a distributor I wonder? Was it the owner or manager you spoke to? I’ll be interested to hear more and will be in touch directly. A real shame. Can’t wait to visit Shakespeare and Co after reading your description of it. My favourite independent bookshop is Topping & Co in Ely. As you browse the books, you are offered a pot of tea! Can’t recommend it enough – I haven’t visited the Bath branch yet but look forward to doing so. Thanks, Jacqui. I fully share your enthusiasm for independent bookshops and the sight of Waterstone’s depresses me.I think the situation is not so bad in France.There are still proper bookshops around – not all of them independent – and places where you are greeted by tables and tables of proper stuff, rather than celeb bios. 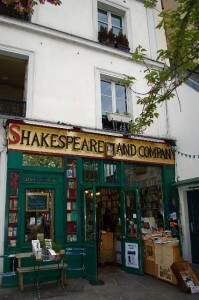 I am sorry to say this but it seems to me that Shakespeare and Co has retained the image of this romantic dream from Sylvia Beach etc, but in practice they are not what they seem to be. Last year the Guardian carried a piece by Jeanette Winterson on the wonders of Shakespeare and Co and I sent them a letter mentioning my experience but, needless to say, they didn’t publish it. At Shakespeare and Co. I spoke to the people working in the shop, and the woman who I was told was in charge. They wouldn’t even open a copy of my book and only glanced at the press pack I had with me.Of course, people treat you differently if you are Winterson. Thanks to Caroline for giving a link to my piece on the Karachi book market. I have collected quite a few treasures from the Sunday Book market here in Karachi and I always had the same question. The oldest book I ever got and is captured in one of the pictures is dating back to 1917 presented by a father to her daughter. There were many such books with their own little stories. Some even had yellowed paper chits inside with grocery lists. I talked to the proprietor of this shop and he said that most of these books are imported as scrap from the UK where a lot of people throw them away without realizing their worth. The proprietor has become smart now and looks at the edition before quoting a price. Earlier he has sold first editions dating back to the 19th century for less than a pound! I know just what you mean about independent book shops. I love Webberley’s in Hanley, going there is a very calming experience and I never know what treasures I will find! Sarah, Topping Books looks wonderful – that cup of tea idea is right up my street – and I am wondering about going to the Bath Festival later this year, so if I do, I will certainly visit. Veena, I’ve enjoyed our offline conversation about Shakespeare and Co. and do appreciate your concerns; I hope they see this and something shifts in their policy towards new authors. Yasir, thank-you for sharing this excellent link; it does entice me to return to India and discover the bookstores too, something I never did on my earlier visits (being so much younger then, it seems a lifetime away). I’ve been distracted lately by finishing my own novel (done at last) but very much look forward to exploring the blogs. If any of you ever get down to Sydney and you have a day to amble, I strongly suggest a visit to Newtown, fantastic people watching and two great bookshops. Goulds, which is a second-hand bookshop that has been there for over 30 years. I don’t know if the staff could help you find anything, a real Aladdin’s cave. A bit further along King Street, is an indie bookshop ‘Better Read Than Dead’, lots of interesting stuff with great staff.